Defines the mapping between code values and octets. A code value (one or more of which compose a code point, or a single character in a coded character set), is encoded as one or more octets. For instance, a UTF-16 code value will be converted to two octets in big or little endian order depending on the character encoding scheme. Definition at line 330 of file BinaryString.h. 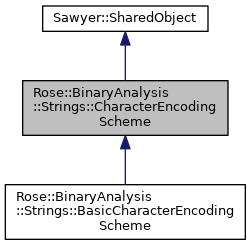 Shared ownership pointer to a CharacterEncodingScheme. Definition at line 338 of file BinaryString.h. Create a new copy of this encoder. Encode a code value into a sequence of octets. For instance, an encoder for UTF-16 will encode a code value into two octets. Definition at line 351 of file BinaryString.h. Processes a single octet and updates the decoder state machine. Returns the decoder's new state. See documentation for State for restrictions on state transitions. Consume a decoded code value. The decoder must be in the FINAL_STATE or COMPLETED_STATE and upon return will be in the INITIAL_STATE. Reset the decoder state machine.